Holy Crappolata! Yes it is me, and I am quite aware that I look as though something terrible has happened to my face. Perhaps, you are thinking, she has had some kind of eyebrow surgery? Had her eyelids removed and replaced with ill-fitting paper ones? No! I’m just sporting a fine pair of Institut Esthederm Patches, is all! Call off the cavalry, there’s no emergency here! I have become a little addicted to these patches, which means (possibly) having to give up my ASOS addiction and releasing some of the equity in my house. Because these patches ain’t cheap when you use them about sixteen times a week. No siree. What Institut Esthederm say about their patches is: that they deeply resculpt and instantly lift the fragile area. 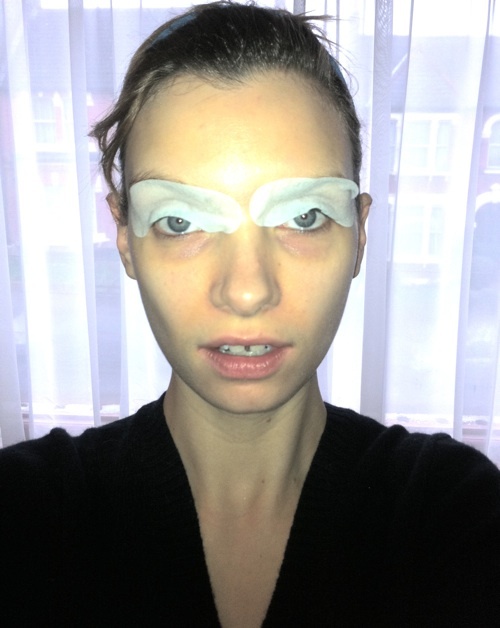 They minimise dark circles, puffiness, sagging and signs of fatigue. BRAVO! I’d like to add some little comments to that: they are instantly soothing and cool, they wake you up, they help to clear a ‘foggy’ head, they make the skin around the eye area ridiculously tight and smooth. Which is why I have been using them on a very regular basis. Of course, I was exaggerating before when I said sixteen times a week; I have been using them weekly as an intensive repairing treat, usually before an important casting. You may be looking at my undereye circles in the above picture and thinking, “well they haven’t worked!” but I’d like to point out that I hadn’t yet applied the patches to my undereyes. Because yes, ladies and gentlepeeps, I use the patches twice! I double-dip, I shamelessly re-use, I peel the patches from the upper lid and re-stick them to the lower! And what’s wrong with that, I ask you? On clean skin that is my own? There’s plenty of magical eye cream soaked into these patches to go around – why shouldn’t my whole eye socket be able to attend the anti-ageing party? The patches really do feel cooling and soothing upon application – they’re slippery but very thin, so they stick fast to the eye area and allow you to get on with whatever it is you want to do for ten minutes. I find that nipping up to the shops with these babies on guarantees me some odd looks and amusing anecdotes to save up in my ‘dull dinner party’ brain drawer, but you could try making toast or checking emails or any number of exciting things. I have no idea what is actually in these patches, but I can tell you that they have a brilliant lifting and toning effect without making the skin feel tight or uncomfortable. There’s just a sensation of intense hydration and freshness. I’m pretty sure that these patches have won me two quite nice jobs recently – and I used them the morning after a rather riotous Bavarian feast a couple of weeks ago, to make myself look human. That was a touch. Now for the unsavoury part: a box (just under £50) contains 10 pairs of patches, which makes each pair around £5. Which means that you’ll be saving these for ‘treat’ days, important events or days when you really need some extra-strength beauty salvaging. Or you might want to use them the other way that they were intended; as an intensive course over a four-week period. Thrice-weekly for the first two weeks, and twice-weekly thereafter. If you have the dough, and you really want to tackle sad, tired eyes, then this could be a good course of action. I have definitely noticed a difference around my eye area, and I think that brightening and tightening around the eyes is probably the single most effective way of shaving years from your appearance. 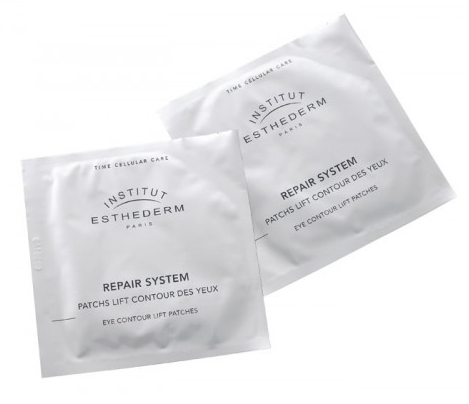 Institut Esthederm Repair System Eye Contour Lift Patches (pack of 10 pairs) are £53 or £47.70 with free delivery from FeelUnique HERE. Previous Post Model Fitness Section: The Launch Party!